The workers of the Diablo Canyon nuclear power plant received a very slimy surprise this week when they discovered hoards of jellyfish-like creatures clinging to the structure, leading to the shutdown of the plant. 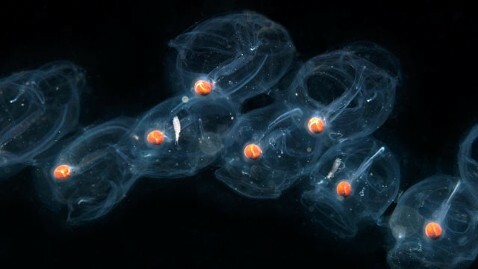 The influx of salp was discovered as part of the plant's routine monitoring system, according to Tom Cuddy, the senior manager of external and nuclear communications for the plant's operator, Pacific Gas & Electric. "We then made the conservative decision to ramp down the affected unit to 20 percent and continued to monitor the situation," Cuddy said. "When the problem continued, we made another conservative decision that it would be safest to curtail the power of the unit." "Safety is the highest priority," Cuddy said. "We will not restart the unit until the salp moves on and conditions improve. No priority is more important than the safe operation of our facility." "We've had salp cling to the intake structure before, but nothing to this extent," Cuddy said. The plant's strategy? Simply wait until the salp move on and resume production once the filters are clear.